Follow your infusion of True Blue Spirulina Shampoo with our soothing, hydrating True Blue Spirulina Conditioner, the yin to your hair’s yang! We have hand-selected the purest, most beneficial organic ingredients to give thirsty tresses the moisture, shine, and bounce they have been longing for. Imbued with a tremendous trifecta of the azulene containing essential oils: Blue Tansy, Yarrow and German Chamomile. This beneficial botanical compound is calming, cooling and is a highly regarded substance for skin and scalp. Azulene along with aloe vera, coconut, spirulina and pomegranate extract guarantee tangle-free locks made lustrous with pure plant poetry! Created with nature’s purest tress attendants, True Blue Spirulina Conditioner is perfect for dry hair, unmanageable manes, tangled locks, dandruff, itchy scalp, over-processed hair, split ends, and poor scalp circulation. Thanks to our infusion of organic, wild-crafted essential oils, this conditioner also serves to lift the spirits, and balance emotions. 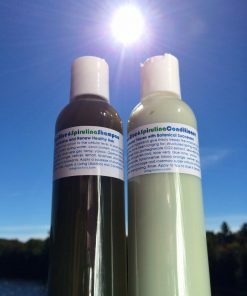 Living Libations’ True Blue Spirulina Conditioner is a cooling, clarifying infusion for body and soul. Perfect for use with our True Blue Spirulina Conditioner, this balancing moisturizer restores hair’s homeostasis, helping hair achieve a halo-of glow and heal from split ends and over processing. 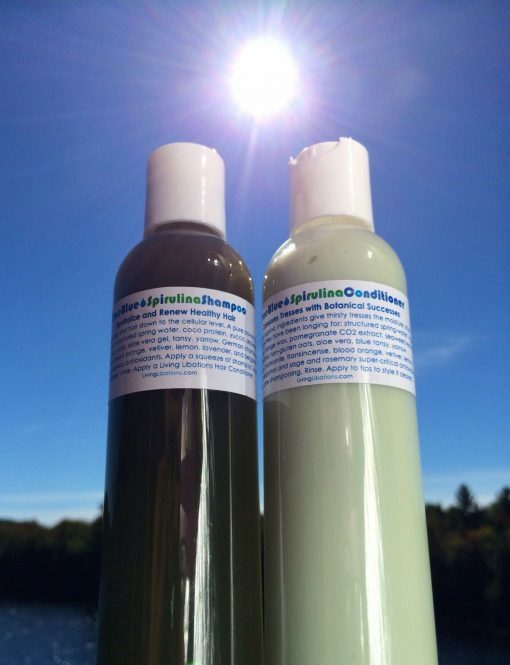 Wild-crafted, organic ingredients of structured spring-water, virgin coconut oil, orange wax, pomegranate CO2 extract, seaweed extract, spirulina, non-gluten oats, aloe vera, blue tansy, yarrow, German chamomile, frankincense, blood orange, vetiver, lemon, lavender, bergamot and sage and rosemary super-critical antioxidants will caress your tresses with creamy-conditioning success. Feels very nice on the hair and has a pleasant scent (to me, less strong-smelling than the shampoo). I find myself using a lot of this but I still have a lot left, which is great. The ingredients are wonderful as always and I definitely feel my hair is well-moisturized after using this. Overall, a great product!